As the door creeks open to another day in the stable, I can't help but embrace my victory over those disgusting things that rear their heads in the barn that I once feared and disliked. Rodents seem to thrive in a stable no matter how many cats you have on mouse patrol. They (mice) are everywhere leaving behind their telltale droppings. My nose has been acutely tuned to the smell of decomposition. After a time, the corpse dries up and you are left with mummified critters. Then there are the body parts left over from a kill by a mini tiger. Usually it's the stomach of the mouse that gets rejected from the meal. Other times you squish and slip on soft mouse parts, cursing the damn thing. One thing I still find repulsive are those mouse droppings. The tiny turds fill any open and close space. Open a drawer and you shake out tons of mouse poop. Clean off a counter one day, the next there is a shower of black droppings. Even with a cat working full time in one room, the mice are winning. Can't use traps or poison with your pets around so you are rather limited with control devices. The worse thing is to find floaters in the horse's water bucket. Once I went to scoop out some hay that had fallen into the water pail and pulled out a bloated mouse to my utter horror. I think I washed my hands a dozen times after that. Now I use a scooper to check buckets. Thank the Lord we rarely see rats. These mammoth size mice don't come around too often. If the mice seem scarce then you probably have rats. So for now I'll have to put up with these pests and hope the cats continue the chase keeping their numbers under control. The spiders are huge and plentiful in the barn. I used to be so fearful of them when I was a little girl. I understand my grandfather had a phobia about them. Spiders and barns just cohabit well. The spiders are wonderful bug controllers and that is what you have to keep in mind. Still it is a little unnerving when you walk into a web. Cobwebs are numerous in a barn. You sweep them away one day and they seem to reproduce overnight. 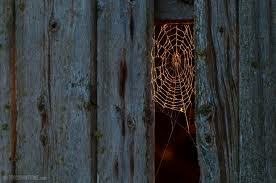 And yes, cobwebs are made by spiders so they don't just appear out of thin air. Although I'm not a fan of spiders, I have learned to live with them in the stable. If I had my druthers, I would pick spiders over mice.